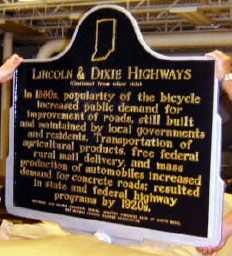 A historical marker for the Lincoln & Dixie highways will be dedicated on Saturday, October 2, 2010, at 10:00 a.m. EDT at the southwest corner of Washington and Michigan streets in South Bend, Indiana. All are invited to join a reception and program immediately following at the American Trust Place – Blue Gallery, 101 N. Michigan St. The marker notes the significance of the Lincoln Highway (Washington St.) and Dixie Highway (Michigan St.) intersecting at this corner. This marker is made possible through the Indiana Historical Bureau in collaboration with the GFWC/IFC Progress Club of South Bend, Indiana Lincoln Highway Association, and the City of South Bend.